Born Lily Chloe Ninette Thomson in the London suburb of Esher, England, Lily James took on the last name James after her late father, James Thomson, who was a struggling actor and musician himself. She began acting at a young age, following in the footsteps of her father and grandmother, Helen Horton. Horton was an American actress who appeared in a variety of films and TV series including Alien (1979), Superman III (1983) and The Benny Hill Show (1979 to 1986). Lily studied acting at the Guildhall School of Music and Drama in London and graduated in 2010. After graduation, Lily took to the British stage, earning many notable roles. After playing regular roles in the TV series Just William in 2010 and Secret Diary of a Call Girl in 2011, Lily made her feature film debut in Wrath of the Titans (2012). She played a starring role as Lisa Temple in the British film Fast Girls (2012), as well as a small role in the indie film Broken (2013) as the older version of the lead character Skunk, opposite Tim Roth. 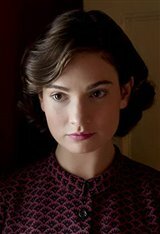 Lily then caught the attention of the producers of the popular series Downton Abbey and landed a role as the young and feisty Lady Rose MacClare. Her biggest role to date was when she landed the starring role as the iconic lead character in the Disney live-action film Cinderella , directed by Kenneth Branagh. Since then, she's appeared in starring roles in Pride and Prejudice and Zombies (2016) and Baby Driver (2017). Most recently, she played the younger version of Meryl Streep's character in the sequel, Mamma Mia! Here We Go Again (2018).